The French were the dominant force when it came to Impressionism, but this did not mean that other countries lagged far behind. Although not as popular as Monet, Pissarro, Degas, Sisley or Cézanne, Russia had a number of prominent artists that were outstanding Impressionists. One such artist was Konstantin Alekseyevich Korovin, one of the most distinguished among the followers of Impressionism in Russia in the 1880s. 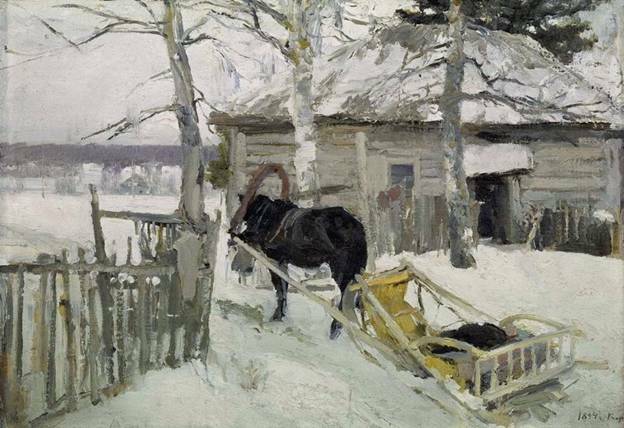 Korovin was born in Moscow to wealthy parents on November 23, 1861. He had an older brother, Sergey Korovin who was a Realist painter. 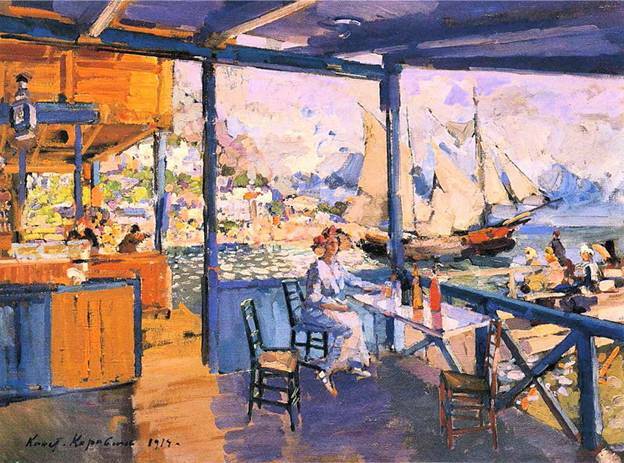 Konstantin Korovin started taking art lessons at age 14 when he enrolled at the Moscow School of Painting, Sculpturing and Architecture. He initially enrolled to study architecture and actually spent two years taking that course before he switched to painting. He later traveled to St. Petersburg to enter the Academy of Arts to continue his art education. He did not last long at the academy though. He got bored with the instruction methods used by the academy and left the school after three months. Although older by four years, Korovin developed a friendship with another Impressionist artist, Valentin Serov, and they traveled around the northern parts of Russia in 1888 as well as in 1894. Korovinwas a teacher at the School of Painting, Sculpture and Architecture in Moscow beginning in 1901. He worked at the Russian Army headquarters as a consultant for creating camouflage during the First World War and designed costumes and stage sceneries for the Mariinsky Theater and the Bolshoi Theater in the 1990s. After the Russian October Revolution of 1917, Korovin became active in the preservation efforts for Russia’s art monuments. He helped organized exhibitions and auctions to raise funds for the political prisoners who had been released, and even collaborated with the theater for his public endeavors. Rather than be a target of government, Korovin left for France following the advice of a Marxist revolutionary,Anatoly Lunacharsky. Konstantin Korovin’s stay in France and the works of the French Impressionists made a very strong impact on his own work, and traces of their influence could be seen on the paintings he did of the Parisian landscapes. When he talked about his creativity, Korovin described it as the pursuit of beauty and being fascinated by shapes and colors, and for the aesthetic influence it gives the viewers.He was not interested in stirring an impassioned feeling and he did not want to convey any moral inclinations to anyone nor did he want to lecture anybody. Korovin was impressed early in his life by the lectures of his art teacher Alexei Savrasov who was an advocate of en plein air painting, which he carried through in his landscapes, such as “The Village,” “Early Spring” and “A Little Bridge.” In these paintings he showed how closely he observed nature and how he worked in his direct perception of it, preserving his fresh impressions by finishing his paintings outdoors. His propensity for outdoor painting was even seen in his portraits, such as his “Portrait of a Chorister.” His impression of Spain came to light in the genre painting “The Spanish Girls Leonora and Ampara on a Balcony.” Although he did several portraits and genre paintings, one of the most notable was “TatianaLyubatovich that he did in 1886, with its complex setting that was a mix of bright sunlight, profuse green background, flowers and a white dress. Although he did not truly feel at home when he was in Paris, the city still gave him plenty of subjects. He particularly liked to paint the nightscapes of the city, although there are also some paintings of daytime hours. Influenced by the French Impressionists, his own works captured the brilliance and vibrancy of the colors and changeable life at different times of the day. Colors captivated him, and he was always impatient when he found something that interested him, trying to capture as much a possiblethe fleetingly fresh impression that he had of a subject matter.